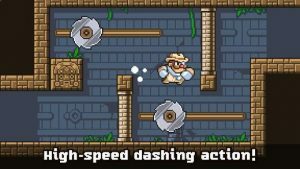 Easy to use dashing controls! 4 different dungeons to explore! 120 rooms of deadly traps and mind-boggling puzzles! Game Center achievements and leaderboards for fastest clear times! Important information! – This game is funded by adverts, but is completely free to play with no timers or boosters to ruin your experience. There is an option to remove popup ads for a one time in-app purchase. You’re very good at making games! I’ve played all that you have on iOS plus almost all on Stencyl Arcade! Can’t wait for the 5th dungeon! Also can’t wait for your upcoming new apps, maybe new Dangerous Dungeons or Tiny Guns iOS! Great job once again! This is a fun little game and it makes me sad the original is no longer available. It’s a good puzzle platformer to play in very short bursts or to beat in an hour sitting. It has a bit of a Warioland 4 vibe to it. Looking forward to the 5th world!